Thank you to everyone that entered the Welcome Contest. The winner of the $25 Amazon Gift Card is Rob from New Orleans. Congratulations Rob! Cadillac currently has an offer going on where you will get a free $100 Visa Prepaid Gift Card by test driving one of their new 2014 cars. The terms say that you have to own a 2004 or newer non-GM vehicle to be eligible for the offer, so this will not work for everyone. Also, you need to show proof of ownership and insurance when you go to the dealership. They also suggest calling ahead to make sure your dealership is participating. You can find all the details here. I’m sure most of you heard about the price increase on Amazon Prime, however all is not lost! You can still lock in the cheaper Amazon Prime price a few different ways. Check out this post for more information. If you would prefer to quit Amazon Prime, then the next best thing might be ShopRunner. 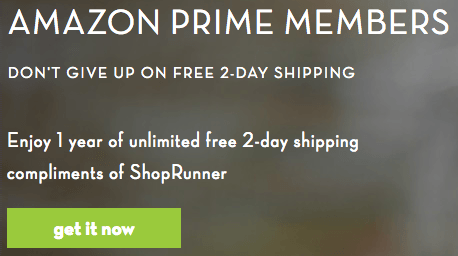 ShopRunner offers free 2 day shipping at 80+ retailers, which makes it one of Amazon Prime’s biggest competitors. You can get a free year of their service if you are an Amazon Prime member that has not renewed your Amazon Prime membership at the higher rate. You do need to show proof of your Amazon Prime account to sign-up. If you are interested in this offer, go here. If you don’t have Amazon Prime, or don’t mind paying a slightly higher price, don’t worry. There is still a way to get ShopRunner for free. American Express offers ShopRunner for free to people with US Customer or Small Business cards. You can sign up for that here. Staples has a great deal going on where you can get 24 reams of paper for free after rebate! Why you would need that much paper, I don’t know, but it is free. You just need to go to a Staples store and buy these paper reams with the coupons on Staples.com and fill out the easy rebate. The cashier may only allow two coupon scans per transaction, however the rebate for both offers has a limit of 4. So, you could get a maximum of 24 reams by going to different Staples stores if they only scan the coupons twice. You will get a check for $3.80 for each single ream rebate you fill out and a $16 Visa gift card for each 5-ream case rebate you fill out. You can find the Staples coupons here. This is offer expires today, so act fast! You can add some manufactured spending to this deal, by signing up for Visa SavingsEdge, using your Ink Bold, and buying a $200 Visa gift card. That way you will get 5X Ultimate Rewards Points, 1% cash back, and FAR paper. If you don’t buy the gift card, you will not get the 1% cash back with Visa SavingsEdge, because you have to spend at least $200. Newegg has a few different Total Defense bundles for sale currently that can make you some money. For example, I took advantage of their offer for the Total Defense software and Call of Duty: Ghosts for $69.99 with a $60 rebate. I then sold Call of Duty for $40. So, after I receive my $60 rebate in the mail, I will have made $30 off of this deal. I could have also kept the game and had a very cheap Xbox One video game. You can find the full list of bundles here as well as the instructions for filling out the Total Defense Rebate. P.S. Newegg is one of ShopRunner’s 80+ retailers, so if you get a free year of ShopRunner you can have your Total Defense bundle shipped via 2 day shipping for free! Vibram FiveFingers Shoes at 6pm.com are on sale for as low as $22.99. My wife and I have a pair of these shoes and we love them! They are awesome to use for travel, because you can wear them in water and on land. I hope you all can take advantage of these great deals. If I missed any, leave them in the comments.